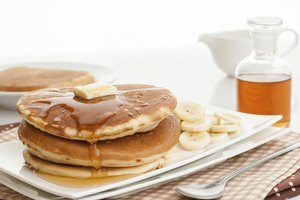 Buttermilk, the thick, tangy, sour-tasting drink, is used in pancakes to give them a distinctive taste and tender texture. Made from low-fat or nonfat milk, buttermilk also presents pancakes with an acidic component, which is needed to help leaven the batter. In addition, buttermilk softens gluten, the protein found in wheat flour, making foods more tender. While you can use regular milk in pancakes, you will not get the same distinctive flavor and texture as found in buttermilk pancakes. 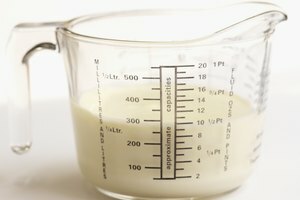 Despite its name, the buttermilk used for making pancakes is cultured buttermilk, and not the product left over after butter making. 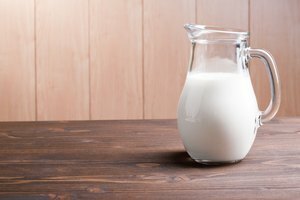 It contains very little fat, but has a thick texture that is a result of the culturing process — the introduction of bacteria to acidify the milk. Buttermilk has a higher acid content than regular milk, which is why it produces fluffier, lighter pancakes than regular milk does. Buttermilk’s function in pancakes is to react with the base found in baking soda. This reaction generates small bubbles of carbon dioxide, which lighten your pancake batter. You will not have this reaction if you use regular milk — non-acidified milk — in place of the buttermilk with no changes. Pancakes made with only pure milk and baking soda will have a leaden texture. However, because the chemical reaction between baking soda and buttermilk is fleeting, the pancakes must be cooked soon after mixing to take advantage of this phenomenon. If you do not have buttermilk at home, you can make do with either soured regular milk, or even thinned yogurt or sour cream. The key for fluffy pancakes is to include acid as part of your dairy component for pancakes, so that the reaction with baking soda can take place. 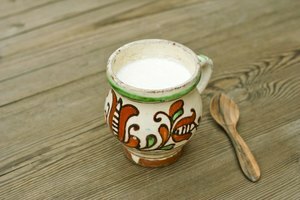 Thin plain or flavored yogurt, or sour cream, to the desired consistency with water, and use it in place of the buttermilk. You can also sour milk by adding a small amount of acid — such as apple cider vinegar or lemon juice — and let it sit for a few minutes. 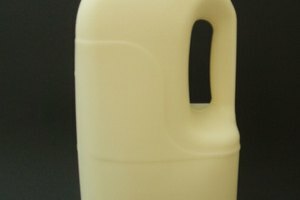 This will cause the milk to curdle, creating a thick-textured, acidic liquid that is similar to buttermilk. Baking powder is baking soda mixed with starch and a powdered acid. In pancakes made solely with milk, you can use only baking powder in place of the baking soda for leavening similar to that produced by buttermilk and baking soda. However, doing this will lead to paler-colored pancakes. To use plain milk — no buttermilk and no souring — for your pancakes but still get a rich, deep browning, substitute one-quarter of your recipe’s baking powder content with baking soda. This will give you similar leavening, but with a richer color, albeit without the tang of buttermilk.